This is either the 1st or 2nd in the Liss MacCrimmon series. Liss has returned to her home town of Moosetookalook, Maine, to run her aunt's Scottish emporium while the aunt is in Scotland. This should give her time to think over her options now that a knee injury has destroyed her dancing career. She becomes reacquainted with one of her former classmates, who is more than ready to help her clear her name after she finds her aunt's neighbour dead on the emporium's stockroom floor. It's definitely a "cozy" but the characters are realistic so you can empathise with them. I was inspired to draw a map of the part of town involved in the story, but I must have read something wrong because it didn't quite work. Join us for meetup: lots of talk, a range of books, good food and art on the walls. If no one takes this it will be left in the entry way. Picked this up at the meet-up. I look forward to reading it. 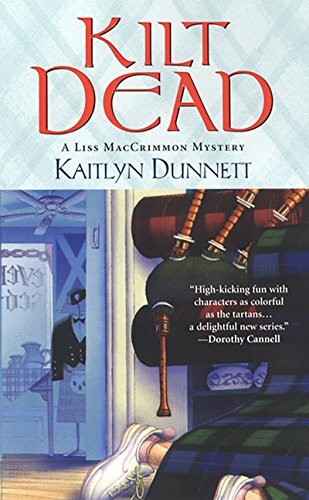 Really like this sleuth and, being of Scottish heritage, I enjoy the emphasis on things Scottish. Sent as a RABCK. Enjoy! Received this yesterday so perfect timing for the holidays! Thank you so much! I really enjoyed this book, more than I thought I would actually! I liked the main characters and the story involved with the mystery and the Scottish references. I look forward to reading more in this series. Adding this to the Cozy Mystery VBB hosted by affinity4books. Given to me by aunt-sophie while she was at my place. Looking forward to read it - sounds interesting! It was given to me by a friend, and I must say it’s a good cozy mystery. Would I say it’s the best so far? Not so sure. I did like but I thought by moments the story was dragging a bit. Maybe I’m used to cozy mysteries going somewhere but here, I didn’t always get that feeling. Still, I liked it and had a great time reading it. There’s not much else I can say about the book. One thing though, I’m not sure yet if I’ll read the other in the series – so much books to read and so little time to do it! Sent for the 2015 Oppem's Birthday RABCK group. Hope everything will be liked! Birthday gift from Carelaisa. Thank you for the cozy mystery!